The first of the peonies and buzzing trees! Peonies are one of my favourite flowers. Something about the oversize, the excess of petals, the total commitment to colour. For now I do have a lovely clematis. A bit washed out for my taste, but A+ for profusion. 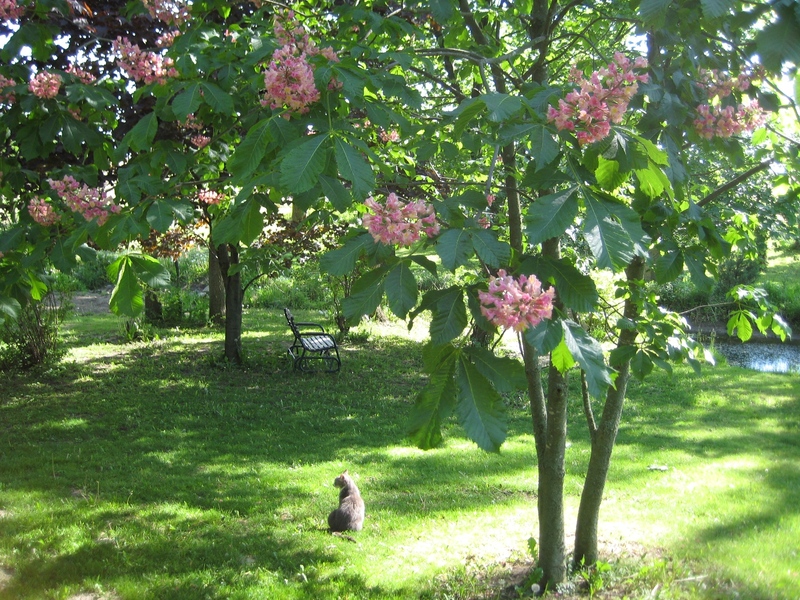 My most recent delightful surprise were the chestnut trees. 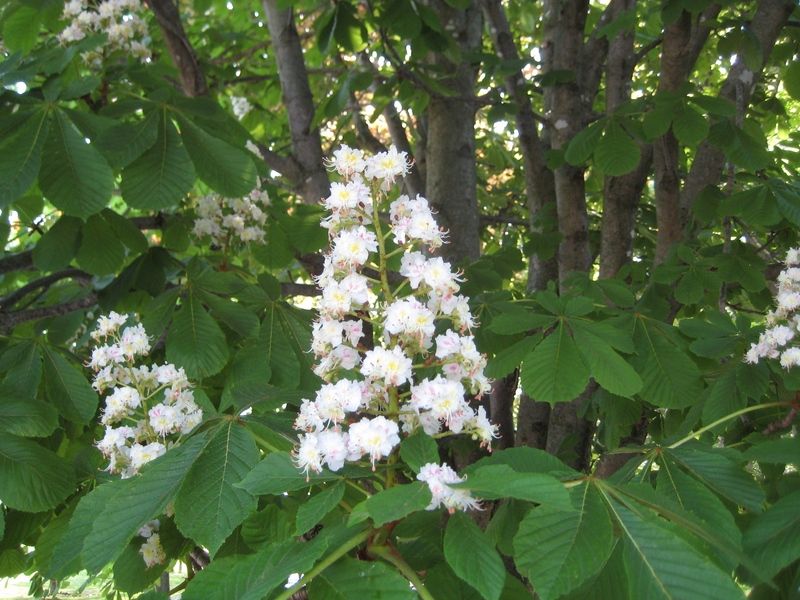 I have done a little research and I believe they will have another proper name, a particular variety, but I will lump them together as chestnuts for now until a tree expert tells me otherwise. 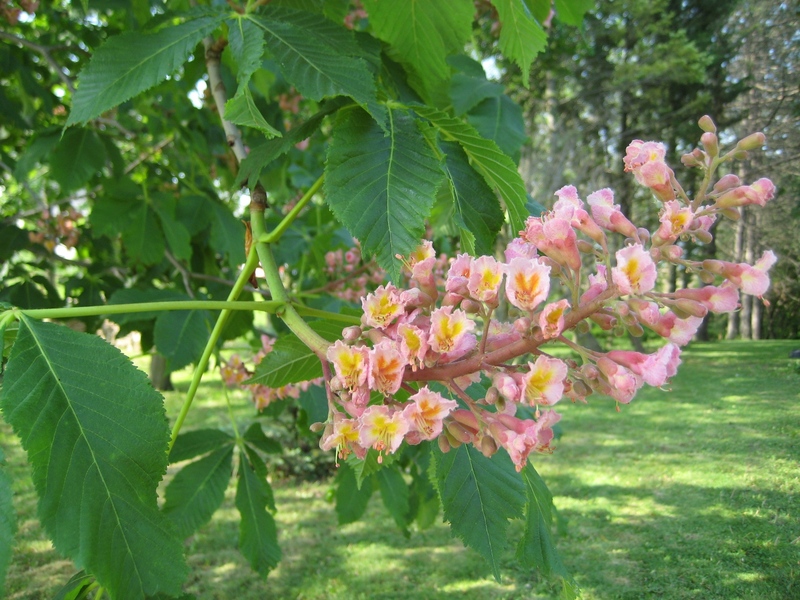 I have never lived anywhere with a chestnut tree before and I didn’t realize the flowers were so incredibly beautiful! We have one that flowered the usual white and it was lovely. This tree is quite large and you can easily stand underneath it. 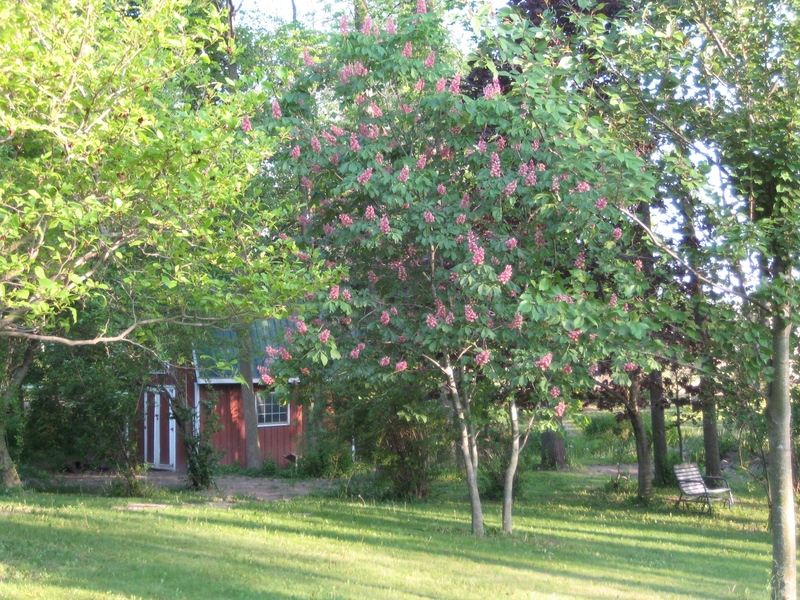 When in full bloom the tree buzzed; it hummed with hundreds, possibly thousands, of satisfied bees. I could not believe it the first time I stood there and realised what I was hearing. They were so intent at their work they paid no attention to the silly human grinning up at them. 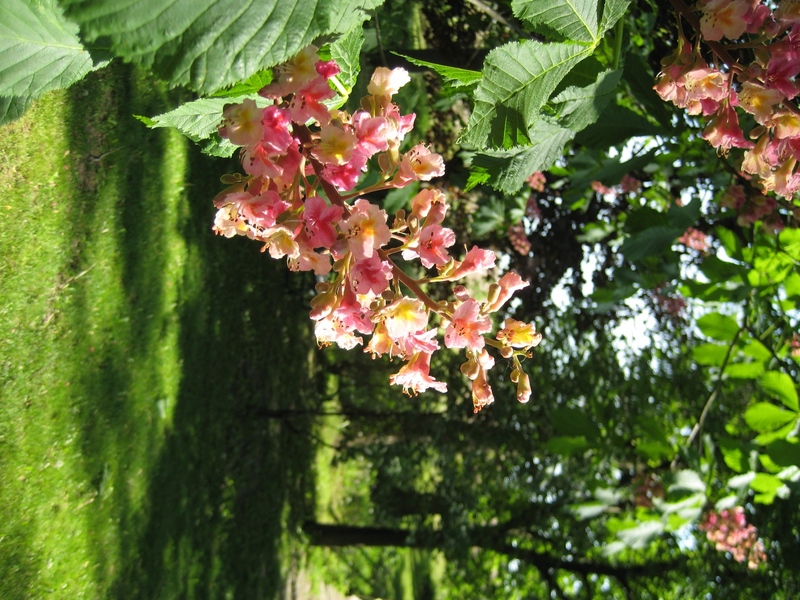 We have several of these – PINK chestnuts. I have no idea how rare they are, but I looked around during the blooming season and could not see another anywhere I went. They are probably not rare at all. I went photo nuts! Princess Crookshanks contemplating her next move. Nap, or chase birds? Note: I know Crookshanks is a male cat in the Harry Potter books, but when we got her as a kitten about 11 years ago we were reading the series as they were published and any cat we got was going to be Crookshanks. She is the smartest cat in the world and speaks english. True story. 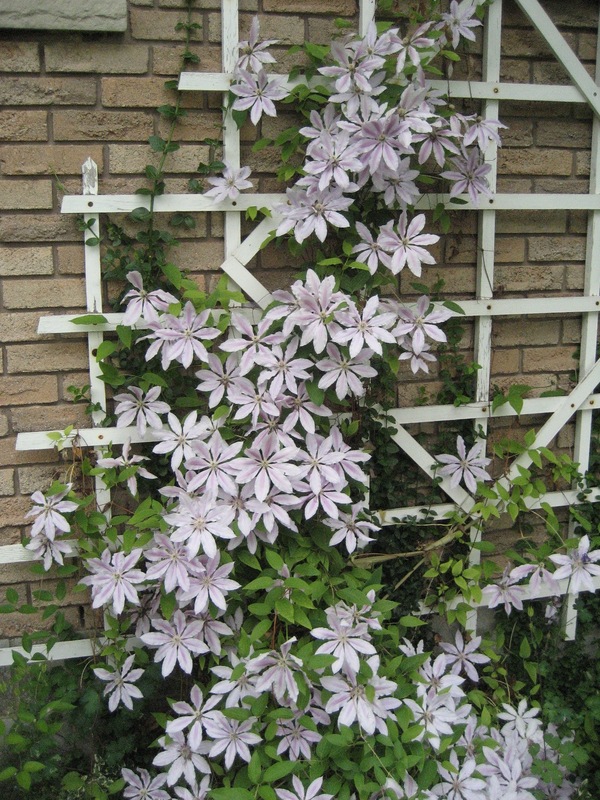 I’m so lucky….my clematis is dark purple and full of blooms and lovely and this year. I really agree with your statement that gardens are so healing. The buzz of the bees in the chestnut tree really is something else. pics look great. I think the English grow way more dahlias than we do. And from what I have seen on other blogs they sell more as cut flowers too. 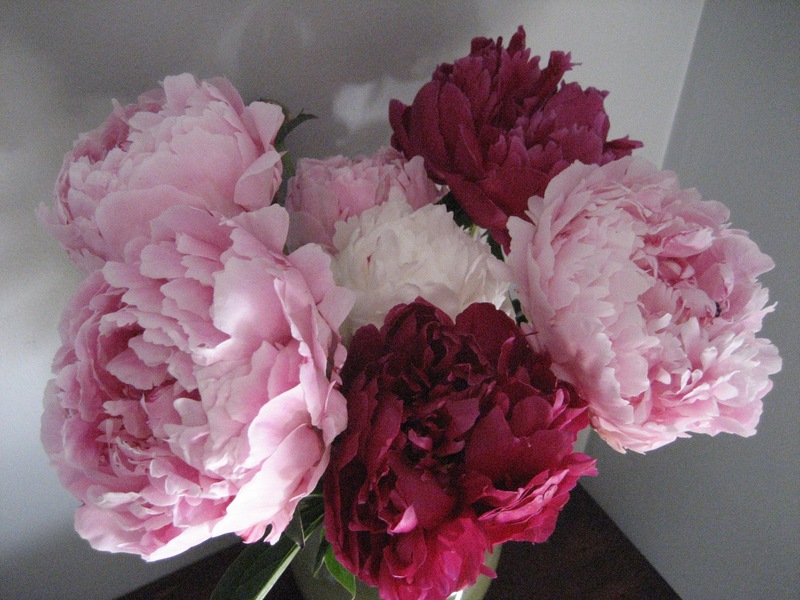 Peonies live a long time so they are a great long term flower. I’ll post a picture of the whole row of them …you just have to not look at the weeds behind….. I work from home for my day job and it is so nice to take my break and just do a once-around the garden stroll then back to the desk. I can let the work tension go and I always feel better for a walk by the flowers. Gardens are so healing! Everything is looking lovely. We don’t have any peonies in our garden, but I hope to rectify that, and have them in for next year. They are so very pretty. I do have dahlias, and they flower very late, so add a bit of cheer as winter approaches. I love clematis, and this one is looking very good. Do you know the variety? Thanks for stoping by Tracey. I agree about dahlias adding late colour, one of the best qualities. I don’t know the variety of clematis as it was here when we moved in. Sometimes I check out the packages in stores to see if I can recognize what I have gowing. Kind of a reverse look-up!